I recently found an incredible scale to use when checking the tracking force on my turntable. 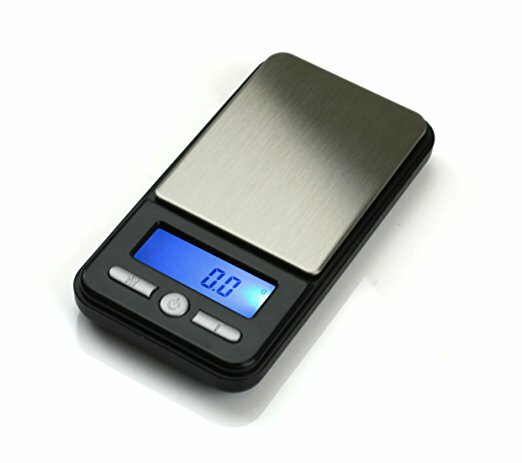 I have used a few different digital scales throughout the years with varied results. I started using a scale like the one to the right a few years ago, but never really trusted that I was getting the correct readout of tracking pressure. The problem I found with this scale was that the height at which I was measuring tracking pressure was about 1/4 of an inch higher than the actual playing surface. I was not sure if this made a huge difference or not. 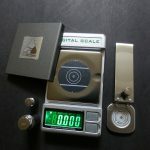 Turns out that there was a 0.5 to 0.7 gram difference between the scale I had been using and the one I upgraded to. Thankfully I found a digital stylus force gauge made by Riverstone Audio, and now I know I am getting a correct measurement of tracking force. Calibration is a breeze with the two included calibration weights and simple instructions, so you can have it up and running just minutes after it arrives in the mail from Amazon. There is even an online video that goes over this process in detail. 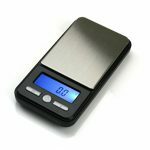 This scale is an amazing value and comes beautifully packaged in a tin with lots of padding for safe transit. 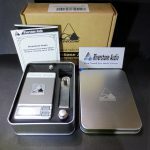 The Riverstone Audio Digital Stylus Force Scale is a professional quality scale for measuring VTF (Vertical Tracking Force) and it is the best quality I have found for under $100. 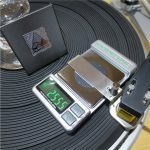 I was very impressed with how this scale performed during the setup of my Clearaudio Concept V2 Cartridge. When used with the detachable cantilevered extension arm it measures VTF approximately 3mm from the surface of the turntable platter. That sure beats a quarter of an inch! It was manufactured using non magnetic materials so it is suitable for use with all Moving Magnet and Moving Coil Cartridges. The green numbers are extremely easy to read as you are checking your tracking force and are also in my opinion very cool looking 🙂 This truly is one of the most affordable and best additions to my audiophile gear over the years. Not only has it made it very simple to check VTF and get a correct readout, but it also makes it safe to do so without worrying about damaging your cantilever or tip. It features a Polymer pad to aid in centering your stylus and to protect the delicate tip. I no longer need to worry about it slipping off the scale and being damaged. I do recommend is removing the battery before storage. I do this because I only feel the need to check my tracking pressure every few months unless I have moved my turntable to a different location. 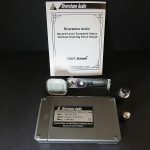 This will help to make sure that battery does not end up drained during storage and that you don’t end up with a damaged scale because of battery acid corroding the connections when it is not in use. 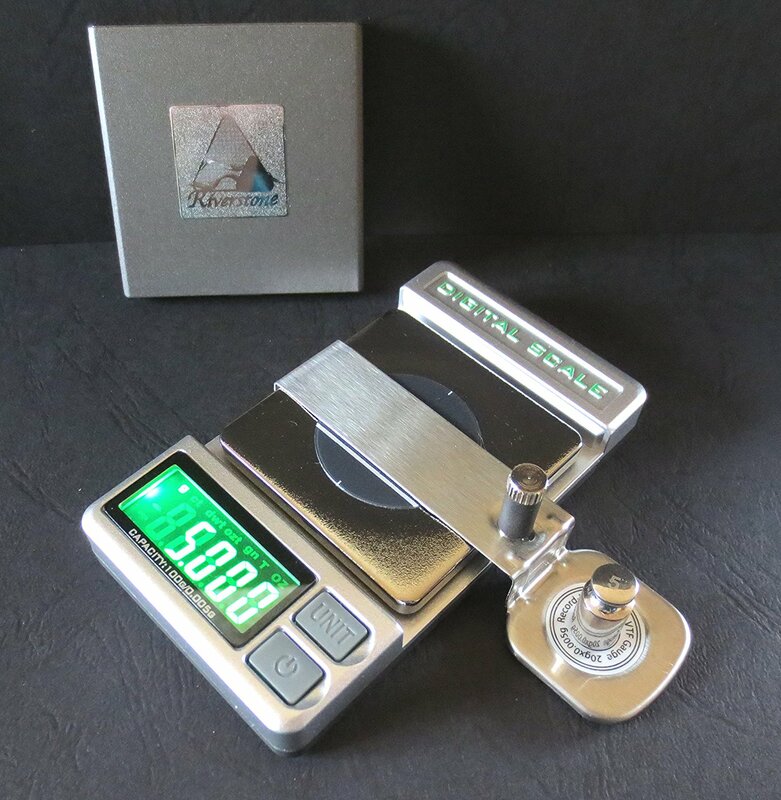 I hope you give this little scale a try for yourself. Clicking any of the photos or the name of the product above will take you to the listing on Amazon where you can find this at the best price possible. I am sure that you will be happy you did!